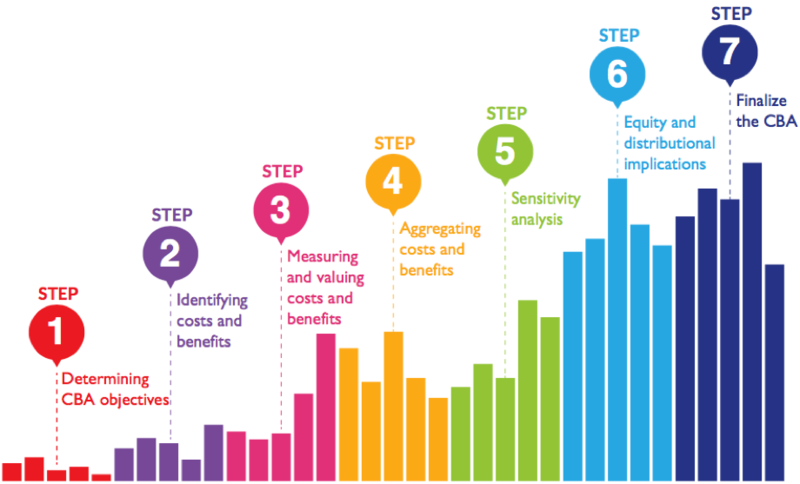 Cost-Benefit Analysis (CBA) is a decision-making tool that helps governments design better policies and implement more effective and equitable projects for long-term sustainable results. As the name suggests, CBA provides a systematic approach for quantifying the strengths (benefits) and weaknesses (costs) from the point of view of the society, helping decision-makers determine whether to invest in a particular course of action and leading them to choose those investments that provide the highest returns for society. After project completion: to evaluate whether the project was a benefit to society and to use lessons for future interventions. In the case of climate change adaptation and climate-resilient development planning, CBA provides a straightforward analytical tool to quantify the impacts of an array of climate change projections in project analysis. Rainfall scenarios, sea level rise, temperature increases, and the frequency of catastrophic weather events can all be worked into the analysis to test whether a proposed investment can withstand the test of time when the climate is changing. This publication describes the Pacific Cost-Benefit Initiative (P-CBA) methodology, which breaks the analysis down into more manageable tasks. The publication is divided into seven sections outlining the seven steps that make up the CBA work plan developed during the training. This is the fourth publication in the USAID Adapt Asia-Pacific Adaptation Finance Knowledge Series. For related resources see the Further Resources section below. The first step in any cost-benefit analysis (CBA) is to establish the objective framework, which impacts how all subsequent steps will take place. This is perhaps the most important step because it establishes how climate change will be addressed in the CBA. To begin quantifying the costs and benefits of specific adaptation options, start by listing out the expected inputs, outputs and impacts (both intended and unintended) of the various options. Be sure to consider the projected changes in climate in the project area. Once costs and benefits have been identified, the next step is to determine how they will be quantified and what information will be necessary to do so. Estimating the present value of the costs and benefits is necessary to be able to compare various adaptation options. Setting the rate at which future costs and benefits will be discounted in order to estimate their value today is a critical step in any CBA. Analysts and policymakers should give careful thought to this step as there is no one-size-fits-all solution. Sensitivity analysis aims to determine whether an analysis yields consistent results, even when there is uncertainty about some of the parameters. It is a practical tool that can be used to mainstream the potential impacts of climate change into the CBA and to assess whether adaptation project options continue to be beneficial under the full range of climate scenarios. Essentially, a robust net present value even after a sensitivity analysis indicates that the adaptation project would be a “no regrets” investment for society. Before the CBA is complete, the analyst must make sure that the value of any adaptation project option is distributed equitably across society and does not create inequalities where benefits are restricted to only a select few, while costs are incurred disproportionately by other groups. CBA helps policymakers be climate-smart in their decision-making, as it provides a practical tool for taking the inherent uncertainty of climate change into account. By quantifying the costs and benefits of adaptation options and comparing them both to each other and to a scenario without adaptation, policymakers are better equipped to make sustainable decisions regarding the investment of finite development resources. USAID Adapt Asia-Pacific (2016) Analyzing the Economic Costs and Benefits of CCA Options. USAID Regional Development Mission for Asia: Bangkok, Thailand. P-CBA is a multi-agency initiative assisting Pacific Island Country and Territory (PICT) governments to better prioritize, design and implement their projects and policies for more effective and efficient climate- and disaster-resilient development. A direct response to national demands for support with Cost-Benefit Analysis, P-CBA targets government officials from central planning or finance ministries, building on existing experiences such as the Pacific Adaptation to Climate Change (PACC) CBA work program and related cost-benefit analysis trainings. Partners include the German International Cooperation (GIZ), the Secretariat of the Pacific Regional Environmental Programme (SPREP), the Secretariat of the Pacific Community (SPC), the Pacific Island Forum Secretariat (PIFS), the United Nations Development Programme (UNDP), USAID Adapt Asia-Pacific, the Asian Development Bank (ADB), and the University of the South Pacific (USP).